The first time I saw a northern shrike was in an open grassy area in Carver County perched in a tree. This bird has a distinctive black mask and white patches on the underside and top of its wings. These white patches are very noticeable when the bird is in flight. Northern Shrikes are just smaller than a blue jay in size. We saw a few Northern Shrikes this November while walking in the local park. Just this weekend, we saw a shrike carrying off a smaller bird with a downy woodpecker flying after it in our yard. Northern Shrikes migrate south from the arctic to Minnesota and other northern States for the winter. 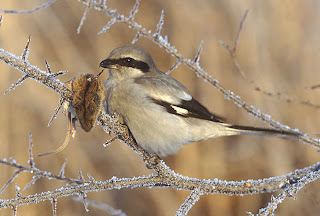 Shrikes are predators, catching mice and other rodents. They will impale their prey on sharp twigs or thorns on trees. 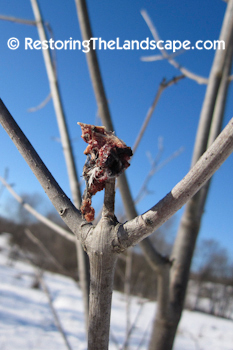 I found the partially eaten remains on this ash tree last week. They also have a distinctive song so keep your eyes and ears open this winter!